Hoggs of Fife, established in 1888, has developed into one of the leading countrywear brands in the UK and Ireland. The Hoggs’ Field Pro range offers an extensive collection of high performance country clothing for hunting and shooting. Over the years, new materials and modern manufacturing methods have been embraced by Hoggs to enhance the appearance, comfort and safety of their products. Hoggs of Fife remain determined to provide value for money and, as a result, have many loyal customers for their quality products. Ladies are primarily catered for in the Hoggs Field Pro range with the Caledonia Tweeds. This tweed is woven in Italy especially for Hoggs of Fife and is made from 60% wool for softness and warmth and 40% mixed fibres. All the Hoggs Caledonia products have been Teflon treated for extra rain and stain resistance. The Caledonia Tweed Shooting Coat has a flattering ladies’ cut and is a waterproof, windproof and breathable ladies’ shooting jacket. It comes highly recommended by existing customers who have found that it performs excellently on the shooting field in all weathers. The Hoggs of Fife Caledonia collection also includes the Caledonia Tweed Waistcoat and the Caledonia Tweed Breeks. New in 2015 were the Caledonia Ladies Tweed/Fleece Gloves which proved extremely popular and to top your outfit there is also a Caledonia Tweed Baseball Cap. For the 2016 shooting season there will be the addition of the Caledonia Tweed Ladies Newsboy Cap and a Caledonia Faux Fur Headband (coming soon). Co-ordinating ladies shirts appear in the Hoggs of Fife Classic Countrywear range; the Hoggs Bella Ladies Floral Shirt and the Hoggs Bonnie Ladies Country Shirt. An excellent selection for a ladies shooting outfit! The Hoggs of Fife Edinburgh Tweed is a unique green based tweed with a claret and gold box check. Made from a blend of 60% wool for warmth and 40% mixed fibres for durability this attractive tweed is used by Hoggs to create its’ Edinburgh Tweed Shooting clothes for men. The Hoggs Edinburgh Tweed Shooting Jacket and the Hoggs Edinburgh Tweed Waistcoat are both waterproof, windproof and breathable with an anti-wicking drip strip around the hem and a warm quilted lining. Matching Hoggs Edinburgh Tweed Breeks are available with the option of an Edinburgh Tweed Sporting Cap or an Edinburgh Tweed Baseball Cap to complete your shooting outfit. 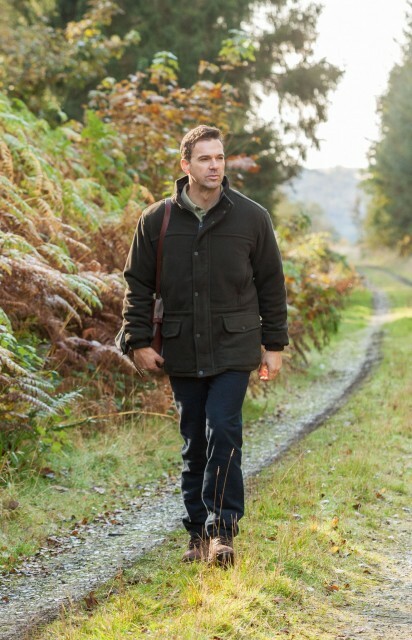 For a more informal shooting jacket, try the Hoggs Sportsman Waterproof Fleece Shooting Jacket, again part of the Hoggs of Fife Field Pro range. This is a ¾ length length all weather shooting jacket in a tough marled green polyester micro fleece which is coated in Teflon® for rain and stain resistance. The Hoggs Sportsman Waterproof Fleece Shooting Jacket has a highly waterproof and windproof drop-liner membrane with fully taped seams plus many other features. If you’re outside in the cold and wet for any length of time then waterproof gloves are a real asset! Hoggs of Fife Field Pro Hunting Gloves are fitted with a waterproof and breathable membrane. The outer fabric is 100% hard wearing sueded polyester with a soft and warm polyester lining. The Hoggs Field Pro Hunting Gloves are suitable for use as shooting gloves as they have soft and sensitive nylon on the trigger finger of both hands, meaning they can be used by either right or left handed shooters. The ant-slip gripper dots on the palm, thumb and non-trigger fingers ensure excellent grip. You could say that Hoggs of Fife Moleskin Breeks are a legend in their own lifetime! Made from Hoggs exclusive “Monarch” moleskin fabric, these breeks are hardwearing and capable of surviving tough conditions. In a dark, olive green they combine perfectly with the Hoggs of Fife Edinburgh Tweed Jacket or the marled green Hoggs of Fife Sportsman Waterproof Fleece Shooting Jacket. Shooting in all weathers often requires a warmer shirt than usual. Hoggs of Fife have the answer with their Birch Micro-Fleece Lined Shirt which has a 100% polyester micro fleece lining. It’s a classic country check shirt in olive and tan but with extra warmth and a vented hem at both sides for ease of movement. New for 2016 will be the Hoggs of Fife Bark Micro-Fleece Lined Shirt in an attractive navy and brown check (coming soon). The Hoggs of Fife Field Pro collection offers a selection of three different wellington boots. The Hoggs of Fife Field Sport Neoprene-lined Wellingtons are incredibly good value for money. A handmade superior natural rubber field boot, they have a 4mm high density durable neoprene lining for extra warmth. Excellent shock absorption is provided by removable cushioned insoles with memory foam inserts and the Hoggs Field Sport Neoprene-lined Wellingtons also have the added benefit of Vibram® soles. The popularity of these boots led to the production of the Hoggs of Fife Field Pro™ All Season Wellingtons. Made from 100% natural rubber, they have a cotton lining and adjustable calf straps for a perfect leg fit. The removable and washable superior gel insoles provide excellent comfort and the deep cut self-cleaning soles offer a great grip. The third pair of wellingtons in the Hoggs of Fife Field Pro range is the Hoggs of Fife Braemar Wellingtons. This classic green wellington boot is handmade of top quality 100% natural rubber to Hoggs’ exacting requirements. A contoured ankle and calf ensures a comfortable fit and there is also an adjustable leg strap. The Hoggs of Fife Braemar Wellington Boots have a slip resistant profiled rubber sole and a cotton lining throughout.